In 1975 Stephen King’s Salem’s Lot hit bookstores and created a new dose of Bram Stoker-ish horror, now Guillermo del Toro, along with Chuck Hogan, have updated vampire lore with The Strain which has been adapted and will premiere on FX; a dash of horror on the small screen. Just as King’s story looked at a vampire invasion of a small Maine town, Guillermo’s and Hogan’s story takes huge strokes across a similar canvas and shows New York being taken over as the first step to a vampiric “final solution” which will eradicate the human race. 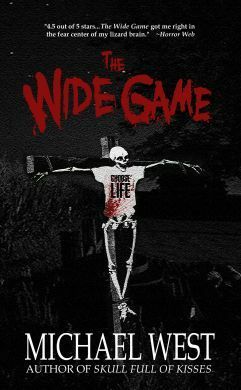 Author Michael West has exceeded himself on this re-release of his first novel, The Wide Game. When this book was originally published it was only 249 pages long and had (presumably) a huge amount cut by the publishing house. Weighing in at a full 395 pages you get a lot of bang for your bucks in this Scare-ground ride of a book. I will admit to being a huge fan-boy of Mr West’s work since “discovering” him on Goodreads. He has leapt onto the shelf of my favourite authors and will no doubt remain there. I first read Cinema of Shadows and after getting hooked on his writing style and the type stories he wrote, I started devouring everything I could read by the man. There is not a doubt in my mind that Michael West will become as popular and as renown as Stephen King. There is a point in the book that is an apparent nod to King’s Pet Sematary and quite possibly to Salem‘s Lot. Not to mention a big “wink” to Children of the Corn. He definitely has that same “cinematic” touch that KIng has perfected over the years and Michael is the only other writer who can startle me so much. The Wide Game introduces us to Paul Rice who has returned with his wife of six years, and their two children, to his childhood home of Harmony, Indiana for his ‘Class of 88’ high school reunion. Unfortunately for Paul this will not be a loving walk down memory lane. It will be a nightmarish “reliving” of the terrifying 1988 Wide Game. The Wide Game is based on local Indian customs. The indigenous tribe in the Harmony area were called (oddly enough) Miami Indians and they were the “bringers of the corn” to Harmony. The game is a race through the corn fields that surround the town. Each year the Senior Class pays a fee to enter the race. Who ever wins the race (the finishing line is a flooded quarry) gets the “pot” and this year it is a thousand dollars. Amazingly the Wide Game has a bloody history. Previous contestants have died or killed themselves. Or vanished. Despite the infamy connected to the game high school students participate in the race every year. We get to meet a young (and old) Robby Miller, who we’ve met before in other Harmony books. His high school years were split between school and working part-time as a paramedic for the towns fire department. We also meet Deidra, Paul’s old flame and first love. We follow the class and the main participants of the game and watch as the events spiral out of control and culminate in a horror filled night of demonic scares and death. Paul has lived with the ghosts of his classmates deaths and a love for Deidra that has never gone away. He must face his past; his demons and Deidra. Michael West has once again taken us to Harmony, Indiana and scared the bejeezus out of his faithful readers. The action moves with all the deadly purpose of a runaway steam train. A train that is full of menace, death, demons, and fear. Like his other books, I could not stop reading this tale and at times I gripped the edges of the book with white knuckles while my eyes raced down the page. I can also attest to the fact that this book actually instigated a nightmare while I was reading about Paul and his classmates. If you have not encountered Mr West’s superior horror fiction, I implore you to do so. Right now. This is a full 5 star stunner of a book. Author Michael West and a Colony Bay resident.